Tramlines, the UK’s biggest inner city music festival, will feature hundreds of bands this weekend in Sheffield and here we showcase 22 of them in our exclusive FREE double album. Download or stream the tracks below for free as we preview some of the top sounds you will hear on the festival’s four outdoor stages and 17 venues, from Friday to Sunday, July 22 to 24. But here we look at some of the latest breaking bands and acts with details, including where and when you can catch them at Tramlines. 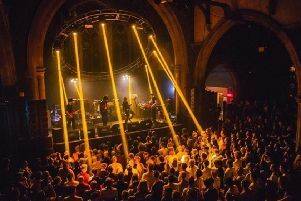 FREE TRAMLINES 2016 DOUBLE ALBUM: Right click on the artist name and song links and save as, to download the songs you want - or simply click on the links to stream the songs on your mobile. Remember to check your data usage allowance, use wifi where possible and always get the permission of the bill payer first. 01. Laura J Martin - Do It: This Liverpudlian songwriter is influenced by her experiences of the city and her social politics. The Folk Forest on Saturday, 3pm. 02. The Big Eyes Family Players - Pendulum: Psychedelic pop from this Sheffield band. The Folk Forest, Sunday, 2pm. 03. King Capisce - St Jude: ​A mix of Jazz and cinematic alternative rock music. Sheffield Cathedral, Sunday, 8.30pm. 04. Pareidolia - You Don’t Even Know. Manchester based modern fusion band, combining soul, jazz, trip-hop and drum ‘n’ bass. Queens Social Club, Saturday, 10pm. 05. Real Talk - I Got Love: Lincoln four-piece playing pop-rock, getting lots of BBC air play. Sheffield Cathedral, Sunday, 7.30pm. 06. Aztec Doll - Bowdlerize: Formed by Roxanna Mitchell and Lee Garforth, described as ‘Siouxsie plays Soft Cell’. Sheffield O2 Academy, Sunday, 2.45pm. 07. Ginger Tom - Never Be Enough: Harmony-rich pop-rock hooks. Main Stage, Saturday, 2pm. 08. Future Wildstyle - On Fire Tonight: A long awaited collaboration between two well established Sheffield DJs fusing Jungle and broken breakbeat. Sheffield O2 Academy, Saturday, 10.30pm. 09: Sundance - Haze. Barnsley-based Oasis influenced indie blues four piece, with big riffs and swagger. Weston Park, Sunday, 3.45pm. 10. The Stars Band - I Didn’t Mean It: Talented group with a range of hidden disabilities. Sheffield O2 Academy, Friday, 7pm. 11. Red Faces - Katie Come Home: Organised chaos and rowdy heartfelt melodies. The Leadmill, Saturday, 7.15pm. 12. Saif Mode - Trree House: A spiritual techno project born out of Sheffield’s Audacious Art Experiment collective. The Harley, Saturday, 8pm. 13. Hot Diamond Aces - Super Moon Sundae: Showcasing Afro-beat, funk and jazz. Yellow Arch Studios, Saturday, 11pm. 14. The Black Lagoons - The Creature: Described by Tom Robinson as “so young, so talented”. Sheffield O2 Academy, Saturday, 2pm. 15. Living Body - Don’t Give Up On Me: Leeds-based Chicagoan Jeff T. Smith (a.k.a Juffage). The Folk Forest, Saturday, 1pm. 16. North Adolescence - I’ve Gotta Get Out: Lyrical themes, a strong grove, gritty solos and a blues bass line. The Ledamill, Friday, 5.40pm. 17. Throws - Harbour: Mike Lindsay and Sam Genders, Tunng’s founding forefathers re-igniting their spark. The Harley, Sunday, 9pm. 18. The SSS - Into The Sun: Sheffield quintet selling out UK venues. The Leadmill, Saturday, 9.15pm. 19. Shinobi - Like I Do: A quarter of Sheffield hip-hop band Clubs & Spades. Yellow Arch Studios, Saturday, 10,30pm. 20: Unit 3 (Kerr) - Bang: Sheffield producer/DJ Kerr moves into more chilled out territory. Yellow Ach Studios, Saturday, 10.30pm. 21. Unit 3 (Palize) - Badman: Unit 3 a Sheffield-based collective whose mixes and productions are played on BBC Radio 1 and 1xtra. Yellow Ach Studios, Saturday, 10.30pm. 22: True Fiction - Merck: True Fiction (1/5 of Unit 3) and Merck (1/3 of Wölfe). Yellow Arch Studios, Saturday, 12am. Pareidolia - You Dont Even Know.